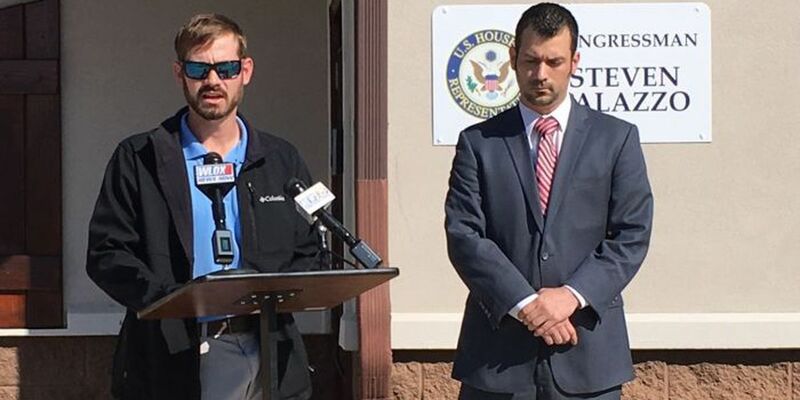 BILOXI, MS (WLOX) - Fourth Congressional District Libertarian Candidate Ric McCluskey again on Monday blasted the military service record of incumbent Republican Congressman Steven Palazzo. But unlike last week, this time McCluskey shared the podium with a retired staff sergeant from the Mississippi National Guard, Rolan Wade. Wade has signed an affidavit claiming he never saw Palazzo show up for duty with the 155th Bravo Company, based in Poplarville. "It was a running joke at every drill, no show Palazzo," Wade said. "Since Congressman Palazzo has made his military service a part of his campaign, it's only fair that we expose his reckless behavior as a servant to the people," McCluskey added. He also claimed at least 12 other soldiers will be signing affidavits, as well. Last week, guard officials in Jackson told WLOX News Now the congressman has been accruing points towards his military retirement, indicating that he has in fact been serving. We also contacted the congressman's office in Washington Monday asking where Palazzo fulfilled his required time with the Guard. Chief of Staff Casey Street told us Palazzo did everything that was required, and the vast majority of the time it was at Camp Shelby, near Hattiesburg. He also said the congressman spent some time drilling at Joint Force Headquarters in Jackson.